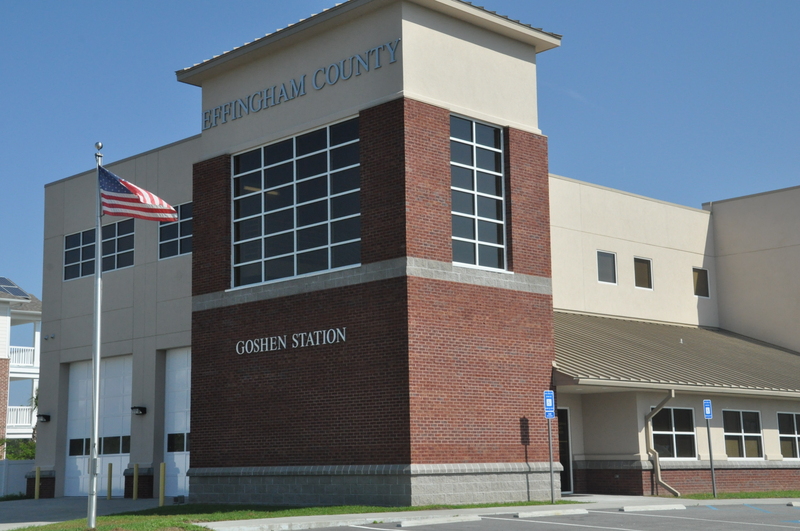 The personnel of Chatham Engineering provided HVAC, plumbing, fire protection and electrical design for a new 9,600sf fire station/public safety building for Effingham County. The facility includes two fire truck bays, offices and work spaces for EMS, fire and sheriff’s personnel and sleeping quarters for fire department personnel. The HVAC systems for the offices and sleeping area utilize high efficiency variable refrigerant flow systems. The bays are heated and ventilated only. The plumbing systems utilize low flow fixtures with infrared control. The water heaters are instantaneous gas fired type which best serves a facility with a variable occupancy. The entire building is protected by a wet pipe fire protection system. Special connections are provided for fire hoses. The electrical system utilizes high efficiency fluorescent lighting with electronic ballasts and occupancy sensors. An on-site diesel engine driven generator is provided for backup power to the critical loads in the building as well as the nearby county well.